Presented in Partnership with the Hawaii People's Fund. Directed by Deann Borshay Liem, Ramsay Liem. USA. 2013. 37 min. Korean with English subtitles. Memory of Forgotten War conveys the human cost of military conflict through deeply personal accounts of the Korean War (1950-53) by four Korean-American survivors. 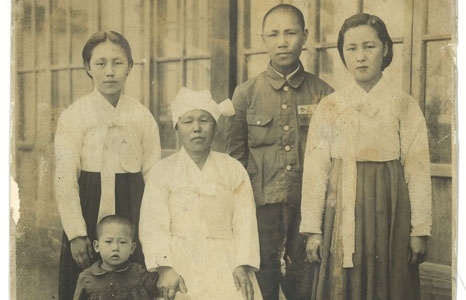 Their stories take audiences through the trajectory of the war, from extensive bombing campaigns, to day-to-day struggle for survival and separation from family members across the DMZ (the demilitarized zone that separates North and South Korea). Decades later, each person reunites with relatives in North Korea, conveying beyond words the meaning of family loss. These stories belie the notion that war ends when the guns are silenced and foreshadow the future of countless others displaced by ongoing military conflict today. The personal accounts are interwoven with thoughtful analysis by historians Bruce Cumings and Yuh Ji Yeon, who situate the stories in a broader historical context. Additional visual materials, including newsreels, U.S. military footage, and archival photographs bring to life the political, social and historical forces that set in motion the tumultuous events of the War and its aftermath. In person: Filmmaker Deann Borshay Liem will introduce the film and take part in a post-screening panel discussion with Gary Pak, Professor at the University of Hawai'i at Mānoa and Christine Ahn, author and peace activist. They will share perspectives on the legacy of the Korean War on the lives of Korean Americans and inspiring initiatives underway to bring a close to Korea’s tragic past. Liem will also share as short work-in-progress sample of the new film, Crossings, which documents the 30 women who crossed the DMZ from North to South Korea in May 2015. Christine Ahn is the executive director of Women Cross DMZ, a global movement of women walking to end the Korean War and reunite families. She organized the 2015 women’s peace walk across the DMZ between North and South Korea with 30 women peacemakers worldwide. Ahn is the co-founder of the Korea Policy Institute and former senior policy analyst at the Global Fund for Women. A columnist with Foreign Policy In Focus, her work on Korea, Asia, militarism, trade and women has been widely featured in The New York Times, San Francisco Chronicle, CNN, Al Jazeera, National Public Radio, The Nation, Huffington Post and other media. She has organized several peace and humanitarian delegations to North and South Korea and has addressed the United Nations, U.S. Congress and National Human Rights Commission in the Republic of Korea. Deann Borshay Liem has more than 20 years of experience working in the development, production and distribution of independent films. She was producer/director/writer for the Emmy Award-nominated documentary First Person Plural (Sundance, 2000; Grand Prize, Best Bay Area Documentary, San Francisco Int’l Film Festival); executive producer for Spencer Nakasako's Kelly Loves Tony (PBS, 1998) and AKA Don Bonus (PBS, 1996, Emmy Award); co-producer for Special Circumstances (PBS, 2007), which follows Chilean exile Hector Salgado as he attempts to reconcile with former torturers in Chile; and executive producer for On Coal River (Silverdocs, 2010) about mountaintop coal mining. She was the former executive director of the Center for Asian American Media where she supervised the development, distribution and broadcast of new films for public television and worked with Congress to support minority representation in public media. A Sundance Institute Fellow and the recipient of a Rockefeller Film/Video Fellowship, Deann is the director/producer/writer of In the Matter of Cha Jung Hee which was broadcast nationally on PBS on the award-winning series Point of View (POV) in September 2010, and the new film, Memory of Forgotten War, about the legacies of the Korean War. Gary Pak is a Professor of English at the University of Hawai'i at Mānoa where he teaches writing and ethnic American literature. He has published three novels (A Ricepaper Airplane, Children of a Fireland and Brothers Under a Same Sky) and two short story collections (The Watcher of Waipuna and Language of the Geckos). His most recent work, Brothers, is set during the Korean War. In the summer of 2013, he was a participant in a Korean War history tour that visited some of the war sites on the Korean peninsula.